The June border explodes with the colors of Baptisia australis (far right), the bright red flowers of Papaver ‘Turkenlouis,’ the dark purple spires of Salvia ‘May Night,’ the deep burgundy red of a Berberis shrub, the playful purple globes of Allium, and the green and yellow blades of Iris pallida Variegata. Steve Silk, a garden designer who lives in Farmington, Conn., believes there’s an evolution in the life of every gardener. 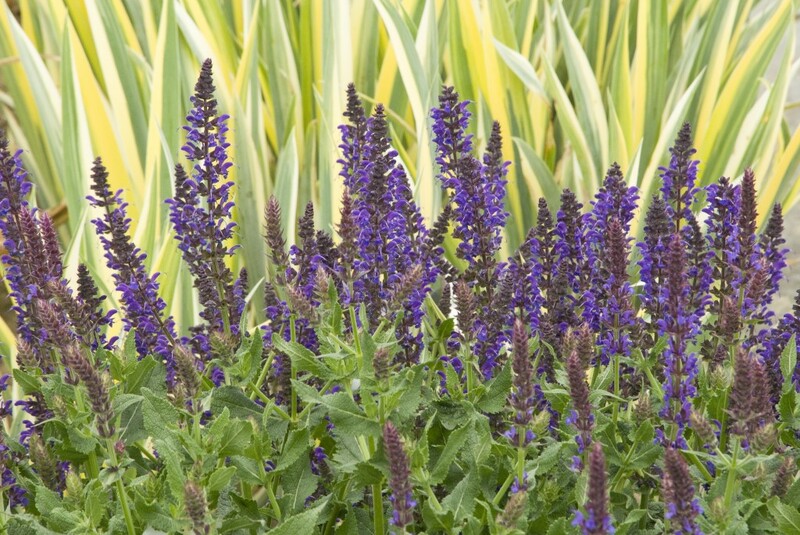 All of us start by falling in love with individual plants – a Peony, a Salvia, a Canna Lily. But gradually, as we develop more of these infatuations, we learn to combine a variety of different plants in pleasing combinations. This ability to create successful plant combinations is the skill that elevates digging in the dirt to an art form. 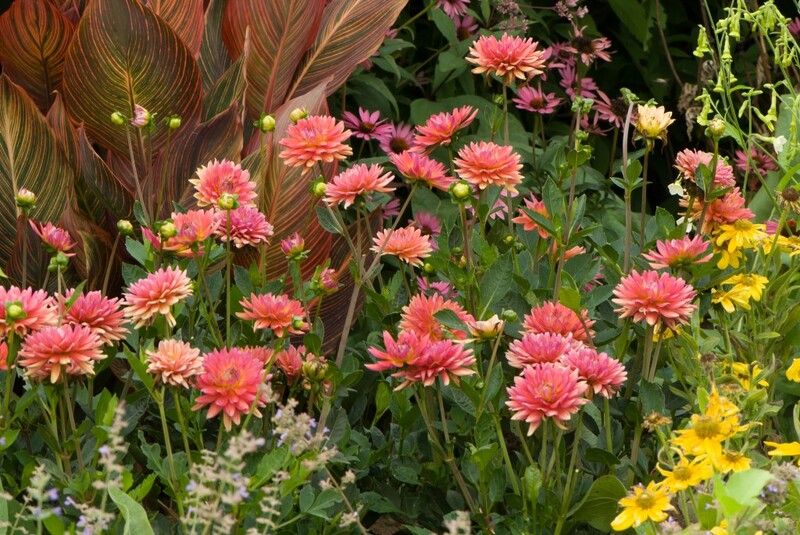 Canna foliage stars in this tropically themed combo which also features the pink blossoms of Dahlias. Combining plants is akin to piecing together a puzzle with parts that shift and change. Plants start the growing season looking one way and finish it another. Some plants bloom early, and others late. Some don’t bloom at all but are treasured for their foliage. Whether a gardener is planting a single container pot or acres of land, each must be familiar with the color, size, form, and life cycle of any number of plants. A plant that’s 10” tall when you buy it might grow to 3’ tall by the end of the season. A Hydrangea with blossoms that are white and leaves that are green throughout the summer might change to a plant with pink flowers and burgundy foliage in the fall. The conditions required by each plant also must be taken into account: It’s no use expecting primroses to survive in dry soil, or hoping hostas will look their best in the baking sun, or planting shade-dwelling ferns beside sun-loving Rudbeckia. 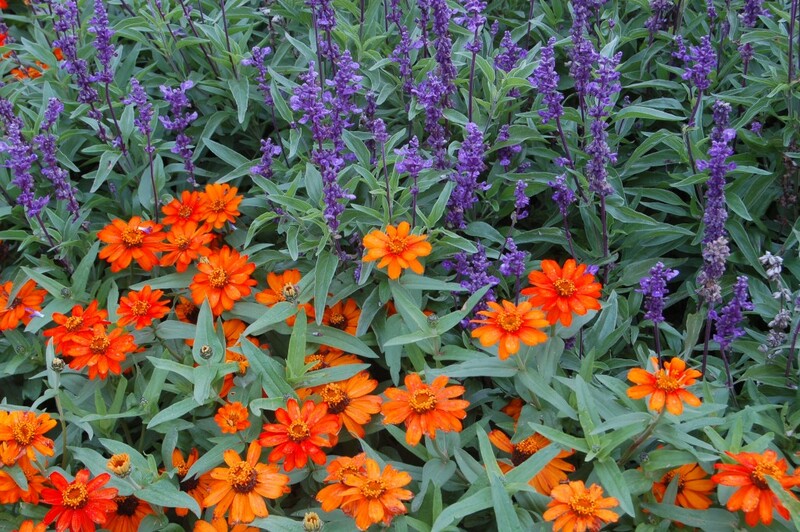 Zinnia ‘Orange Profusion’ makes a terrific pairing with the purple spires of Salvia. Successful gardeners have a familiarity with the plants they’ve chosen, a great eye for combining color and form, and an exceptional amount of patience. The latter is required because it can take a full season to appreciate the effects of a planting choice, and another season to modify it. Gardeners learn by trial and error. When one plant combination isn’t successful, it’s time to make alterations and try another. Another great way to learn is by seeing what other gardeners have done. We visit botanical gardens and private gardens all the time. We also experiment each year in our own borders. Each season brings the opportunity to play with new plant combinations. We try this, and we try that, and we learn a great deal. We invite you to come to our display gardens and see our experiments, and we hope they’ll inspire you in making some of your own.